There's not been much sewing going on at my house. I tagged along with my husband on a business trip, which I would do more often if his business destinations were in great places, like this trip, on the beach. Most of the time his travels are less scenic, and the weather not much better than where I am. 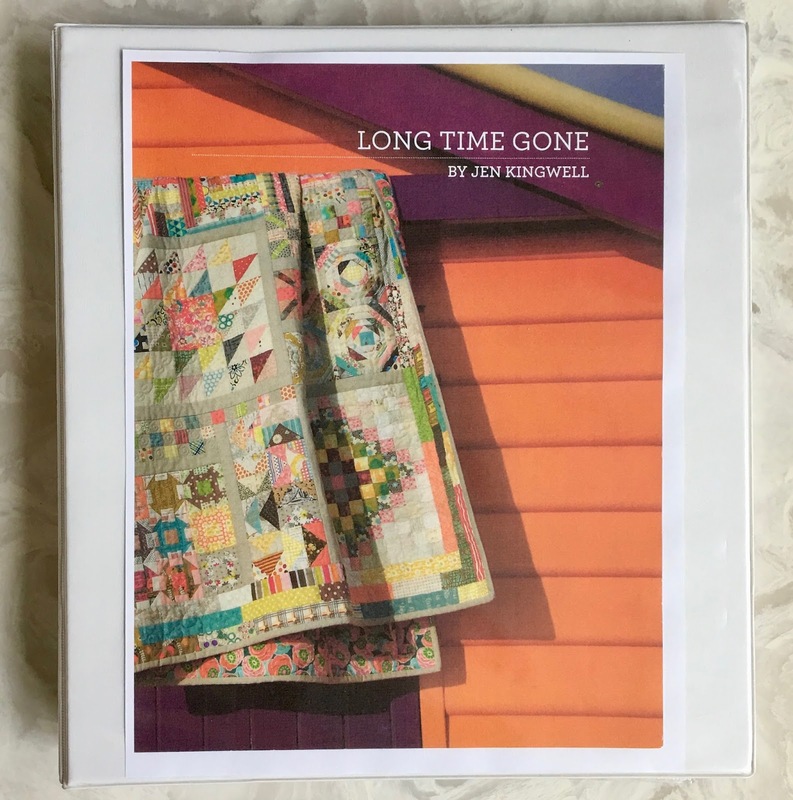 While sitting on the beach I studied this book, Long Time Gone by Jen Kingwell. I studied this book so hard the staples came out and all the pages came loose. 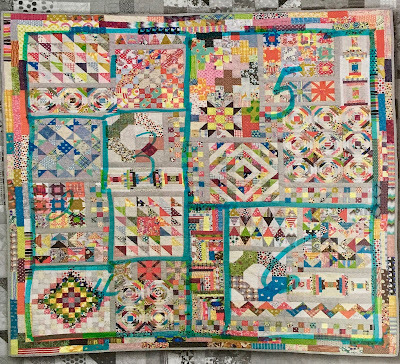 There's a whole lot of sewing going on in this quilt. So much sewing that I've decided to spread the fun out over this entire year, making this my special Year of Thelma quilt. The pattern is broken down into 6 sections. I think I'm going to start with Section 2, it looks the easiest and least time consuming. Section 5 will probably take me all summer. Now I just need to decide on some fabric and get going. Another task that I completed that was quilty related but not sewing related was my quarterly quilt refold. If the quilt is folded outside I switch it to inside, folded lengthwise becomes widthwise, and so on. 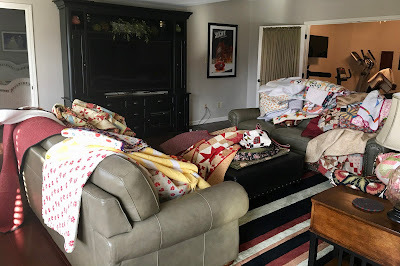 I enjoy looking at all my quilts, organizing them again, usually by season, and putting them neatly back on my quilt racks and shelves. They were a mess after my Pride of Prairie Trunk Show. It normally doesn't take all that long, but my arms sure are tired when I'm done. And finally, this is back out on my design wall, Zipper by Camille Roskelley for Thimbleblossoms. When I blogged about losing my loving feeling for this top I got some great comments. One quilter suggested making it a table runner, which I thought was a good idea, but making a bed runner an even better idea, and initially my plan. Someone else pointed out that this quilt top was too pretty not to finish. Well when I got this project back out I discovered I had more completed than I remembered, and it was too long and too narrow for a bed runner for my kingsize bed. So now I've decided it is too pretty not to finish, I only need to add around 15 more rows. I also now remember why I put this project in a project box. I started the project using Little Black Dress, then decided to jazz it up by adding Black Tie Affair, both by Basic Grey for Moda. To get the two fabrics to blend together I needed to un-sew a few rows, add some Black Tie Affair, then sew them back together. That's where I am right now, separating what's already combined, then I'll sew some new rows. The pieces are all cut and ready, they just need to be sewn together, easy peasy. And I'm not stopping until it's done! And finally, thanks so much for the great response on Miss Rosie's Quilt Co's new book, Farmhouse Favorites, and joining me on a sew along. There was such an enthusiastic response Carrie donated two books and I'm donating one. The winners are Peggy in NJ, Debra from MD and Nancy Lewis from PA. Nancy and Peggy, I sent you an email, I need your mailing address please. As far as the sew along goes, it's going to be very simple. Start when you want, do any Miss Rosie's Quilt Co pattern and finish by the end of 2017. A nice way to wrap up the Year of Thelma. I plan to start Due South the end of March. Send me updates and pictures as you progress, I'll blog about any updates on Fridays throughout the year. 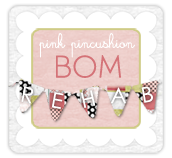 If you have a blog send a link and I'll add you to my blog roll call list. And at the end of the year we'll have a parade of all the finishes. I can hardly wait to see what you make, Due South so far seems to be the most popular pattern choice, I love nothing better than seeing the same pattern made with different fabric. Whew, I think that's it! Just one blog post this week, but a long one, I hope you made it to the end! I had put the sew-along aside because I needed to catch up on other things. 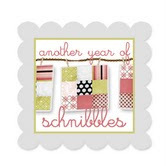 Now that you mention we have the whole year to finish, I'll get those fabrics back out. I love that Jen quilt. So happy that you are doing it. I'll get my pom-poms out and be your best cheerleader! I have that Jen quilt on my "to do" list also. I look forward to seeing what fabric you pick. I think I am going to do mine in the (over)abundance of Fig Tree fabric I have hoarded. Might even break out some of the really old collections that I have saved for a "special" quilt. 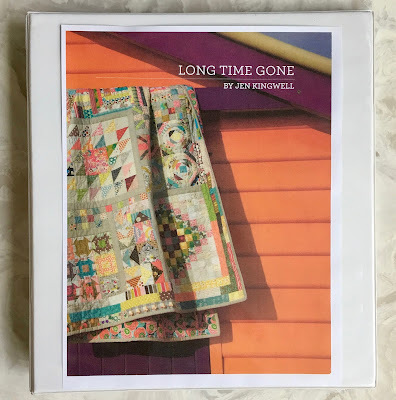 I loved that Jen Kingwell quilt when I first saw it last year. The BOM price was a bit dear for my wallet at the time and, well, I'm hesitating now because I'm not confident my fabric choices would be as good as hers and that makes the quilt. IMO. Perhaps watching your progress will encourage me to be braver about that aspect. Meanwhile, I need to figure out when a whole lotta geese can flock to my machine for Due South. I really had bad luck with my Long Time Gone booklet because I bought a copy with all pages wrong. Some were there double or trice others totally missing it was a mess. I was so disappointed and posted it on IG and lucky for me (and basically she's a great person) Jen Kingwelll answered and send me another copy. 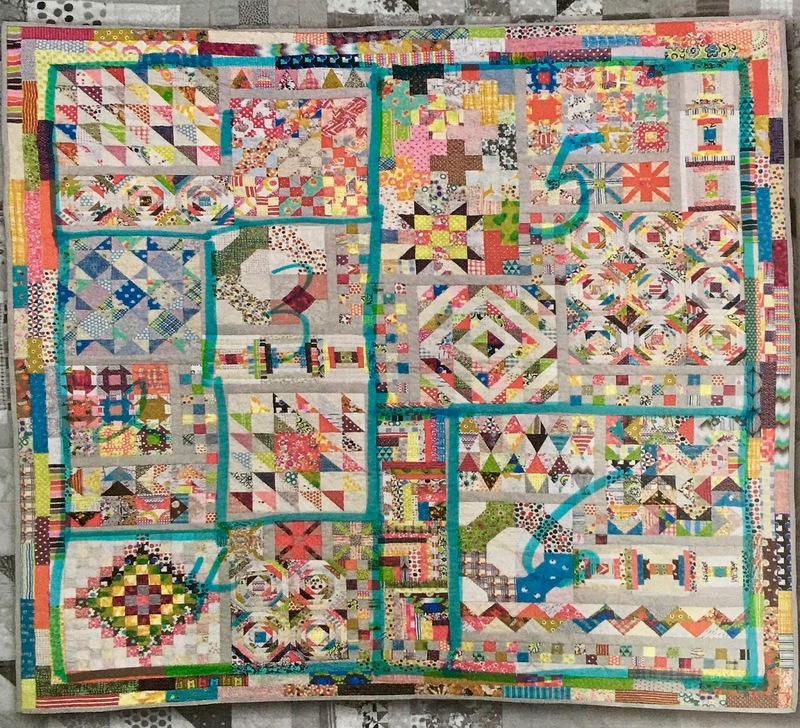 I'm now waiting for it and decided to to make this quilt totally from my scraps (about 75% will be B&C fabrics then;-) Can't wait to see which fabrics you will use. Looks like you are having lots of fun with that book! 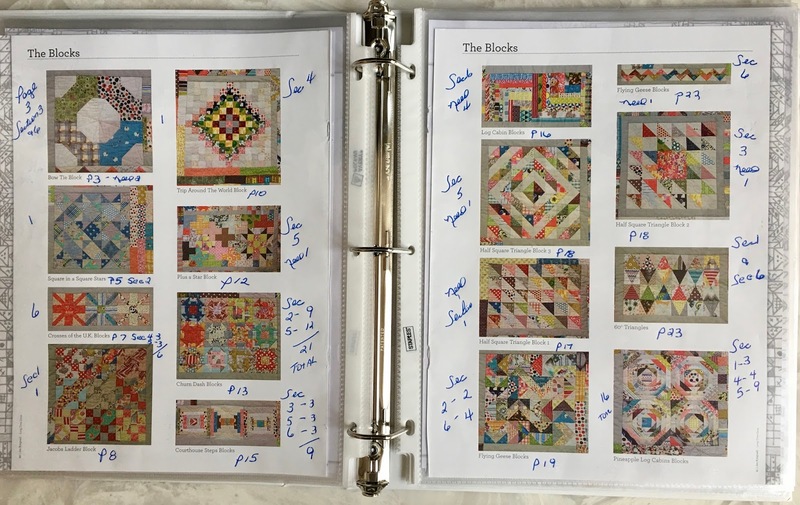 I love that kind of quilty planning! I've always wanted to make a Miss Rosie Quilt and even bought fabric for one. Your challenge for this year sounds great. I've been picking up speed with my UFOs, but this little push is a good one.